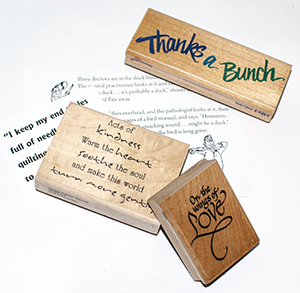 1) Stamps: One obvious way to pick text for a card is to use a text rubber stamp. Text stamps are often not the most exciting types of stamps, but they can sometimes be the most practical. I suspect that most of us who stamp cards have a selection of stamps for the types of occasions for which we regularly create cards, things like birthdays, good wishes and major holidays we celebrate. 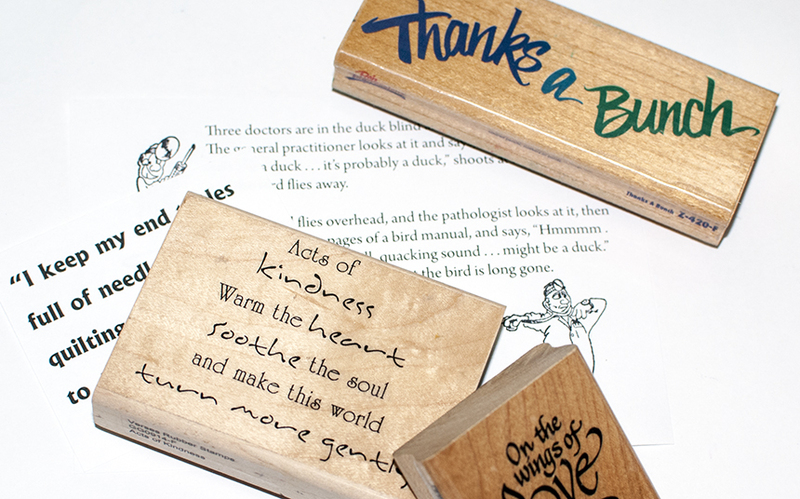 We also might have a variety of other text stamps that caught our eye originally because they expressed a beautiful thought or were funny or were designed specifically to go with other stamped images we’ve got in our stamp collections. Sometimes the text stamp actually inspires the card. For example, I’ve got a text stamp from Stamp Oasis that reads “If I had a flower for every time I thought of you, I could walk in my garden forever.” This text is general enough that it can work in a variety of situations and because I have many different flower stamps, I can fairly easily work into a variety of cards. 2) Quotes: But sometimes we don’t have the perfect stamp. For example, a family member is in the hospital right now and I wanted to make him a get well card. But the text stamps I had just were not a good fit. He likes funny cards and I didn’t have a funny get well stamp or any other text stamp that seemed appropriate. My strategy in this kind of situation is to hit the internet for quotes. (You could alternatively use quote books.) There are quote sites for all kinds of things including, as I recently discovered, quotes about all kinds of illnesses. To find them, you just need to Google what you want, for example, “get well quotes” or “get well messages.” Or even get more specific and include the illness. Some quote sites are better than others. I personally like the sites that credit the quote’s author; not only is it the right thing to do, but the quotes sometimes become even more interesting if you know where they originated. When I still couldn’t find the right quote for this particular card, I expanded my search to “get well jokes” and “doctor jokes” until I found one that I think might give the recipient a smile. Once text is found, I copy and paste or type the text in my layout software. (I use InDesign, but you could do it in Word or even PhotoShop Elements.) I tweak the font and font size and do a test print on regular paper before finally printing it on good cardstock or glossy photo paper and using it as a layer on my stamped card. Note: If you know what you want to say but you don’t have it in stamp form and you don’t want to type it and print it up on a computer, you could alternatively write it by hand. See VSN’s “Doodling, Hand Lettering & Stamping” eArticle. 3) Skip The Text: Then again, sometimes I bail on the text all together. Sometimes I just focus on creating an attractive card front. It might be an elegant (or simple) layered creation or a stamped scene for example. There might be no text at all on the front of the card. Then inside the card I write a simple handwritten note. 4) Collect Text: Another strategy is to collect card text. Maybe you receive a card with text that you really like. You might save the card or jot down the text in a journal so that you could use it for inspiration for a future card that you make. Or you could look at commercial cards sold in stores o r online for inspiration. You might save quotes that you come across in books or online that might work for a card. And sometimes definitions can work for card text. For example, you might include a definition for words like “friend” or “loyalty” or “joy” or whatever. Print it out or even use an actual page from an old dictionary or thesaurus with the word and definition highlighted. So how do you choose words for your stamped cards? I have relied on all of the above you mentioned as well. But sometimes I write my own personalized sentiment or poem for the inside of my cards just for that someone special. And, yes, that involves some thought and time but in the end, I think the recipient really appreciates that it is a personalized one. It is so nice to have a computer now to put my verse file on, so that when I need a certain verse I have it already there at my fingertips. I usually do a “copy and paste” and print out the sentiment. Some can be just changed by a word or two or a name if it was specified for a certain person. Thanks so much for asking. Lots of good advice Nancy… I know a lot who really have a hard time trying to figure out what to put on a card. I have pinned your article for future ref!! OMG. Words are my life. I have the BEST time with the words. I often invent them and then they are computer generated. Lately there have been SO many great word stamps, though. For my easel card – well that was a happy coincidence. I found the cat stamp on eBay and then the word stamp just magically appeared. Be sure to look at http://www.rileyandcompanyonline.com for just the right words.